Mordian 7th Regiment: 40k Genestealer Cult - Demolition Claw Rockgrinders painting begins! 40k Genestealer Cult - Demolition Claw Rockgrinders painting begins! Tonka tough! 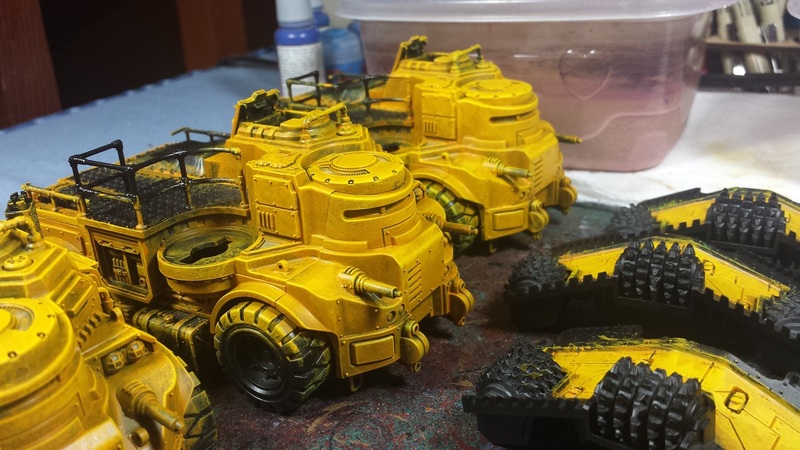 I knew from the outset that I wanted to paint up the rockgrinders in the ubiquitous construction vehicle yellow suitable to their industrial/miner background. So that meant busting out the tank brushes and going to town with the yellow! I kept these models in a fair few pieces to facilitate painting, I'm going to focus on the vehicles themselves for now, then attack the crew separately. My current yellow recipe starts off with a basecoat of Vallejo Scrofulous Brown which is a similar shade to Tausept Ochre - a nice yellow-brown that lays over black reasonably well. Still takes a couple coats but I left it a little patchy here and there to give them some depth as the further colors get laid in. They were next given a heavy drybrush of Vallejo Golden Yellow, and then a light drybrush of GW Flash Gitz yellow - the bright overhead lights tend to wash that out a little in the pictures, however. The last step of the evening was to give 'em all a nice wash with Seraphim Sepia which blends the highlights in a bit and gives the color a bit more depth in the nooks and crannies. These will be left to dry overnight (they're still a bit wet in the picture), then I'll give them some spot pin-washes to accentuate a few areas, and perhaps another light drybrush with the Flash Gitz yellow to help the edges pop a bit more. Once that's done the next step is the tedious re-blacking of all the areas I slopped yellow on to in the drybrushing stages! 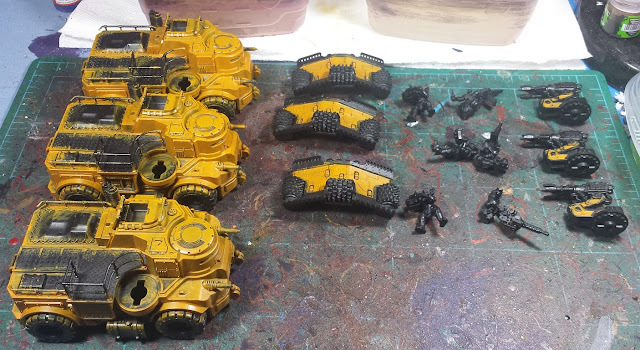 In the end they're going to get some nice sponge weathering/chipping, and I have a feeling it's going to really look neat against the brighter yellow. So far so good! Might have to steal that yellow for Imperial Fists, looks nice and quick. @Rory Priest: Cheers! This is the same scheme as I'd used on my Fists a while back (and may be making a reappearance on the new Mk.III plastics from the Prospero box! @Zzzzzz: Was thinking the same thing! They look great! Can't say as I envy you painting them yellow though, I may have conquered it in terms of painting hazard stripes but I certainly don't fancy a whole model like that! Really tempted to use my BaC and find some really cheap way of doing breachers for the lot of them. Stone Gauntlet is such a thematic idea, just hella expensive. My first attempt at alternative shields didn't work and I think they need the arms to match. I spent some time last week looking at construction equipment in prep for my (eventual) cult. I was thinking Yellow too. Looking great so far! If I even get a Goliath I'd love to do it yellow but not sure if I can as most of my own cultists will eventually be wearing red/orange uniforms and this may be a step too far. They look awesome though. Cowards, the lot of them. Even their tanks are Yeller! Okay, I'll go fetch my coat... sorry. 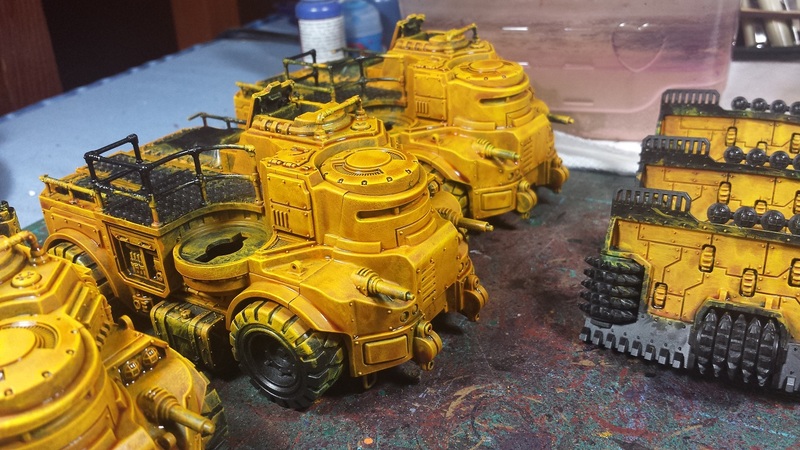 @Nick Thrower: This yellow recipe is actually a snap to do, and suits my messy drybrush and liquid talent style to a T. The wash step can be dicey on vehicles, but it really works a treat for infantry! @Rednekkboss: Thanks very much man! Thanks for the kind words and encouragement folks!